The gently rolling hills of Burgundy are famous for producing some of the best wines in the world – Chablis, Côte de Beaune, Côte de Nuits, and more. In the iconic countryside vineyards, the neat and lush green rows of grapevines stretch to the horizon, rising up slopes and down. Scenes like this are just one of the many you can expect to see on a leisurely canal cruise through this picturesque region. European Waterways has always recognised the rich culture and history that imbues these hills, and that’s why we’re thrilled to see that these stunning vineyard vistas are finally getting the international acknowledgement they deserve. This year, the vineyards of Burgundy and Champagne have been officially recognised in the latest inclusions to UNESCO’s list of World Heritage Sites. The United Nations Educational, Scientific, and Cultural Organisation has been naming World Heritage Sites every year since 1978. In order to become a site, a place – such as a building, city, forest, or island – must be of special natural or cultural significance. Other sites currently with the UNESCO World Heritage Site designation include the Taj Mahal, Machu Picchu, and the Great Wall of China, so the Burgundy and Champagne regions are in illustrious company. In order to evaluate nominated locations, UNESCO uses a set of ten cultural and natural criteria. Nominated sites must meet at least one of these criteria in order to gain UNESCO’s recognition. Gaining UNESCO World Heritage Site status is a big deal. Nations may work for years to prepare their nomination, and preservation experts hope for the support funds that are sometimes available as a result of recognition. And, of course, the UNESCO seal of approval is never a bad thing for the tourism industry! Burgundy gained entrance to the prestigious list of World Heritage Sites only this past July. To be more specific, Burgundy’s climats and terroirs gained entrance to the list. Climats refer to the neatly defined sections of vineyard on the slopes of the Côte de Nuits and the Côte de Beaune, which lie to the south of the city of Dijon. These 1,247 individual climats of Burgundy are like small terroirs, specific wine-producing areas that yield a distinctive product. The concept of the terroir is based on the idea that the environment of any given area – its soil, its altitude, its slope, its exposure to sunlight – majorly influences the wine produced from that area. The same grape may be planted in two different but nearby climats, but produce a totally different wine, according to the theory of terroir. This is why French wines are often identified by location rather than grape variety. In Burgundy’s case, the climats and terroirs met two of UNESCO’s criteria: ‘exceptional testimony to a cultural tradition’ and ‘outstanding example of traditional human settlement representative of a culture.’ Burgundy’s outstanding vineyards have been cultivated since the High Middle Ages, and make some of the world’s finest wines. 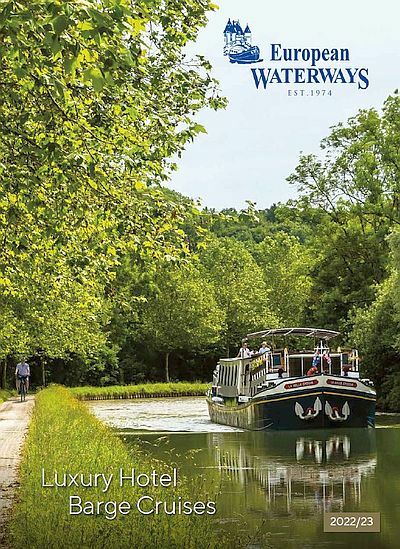 To see and taste the spectacular cultural landscape of Burgundy, European Waterways has put together a dedicated Wine Appreciation cruise along the Burgundy Canal. The cruise, aboard one of our luxurious hotel barges, includes off-shore excursions and private tastings in some of Burgundy’s finest wine cellars, visits to the towns of Beaune and Dijon, and walking and cycling exploration of the picturesque countryside.